Toothbrushes are a necessity because maintaining good dental hygiene is crucial to our health. Since so many people use them daily, there are now various kinds of toothbrushes available to meet specific needs. People have different preferences and having the right kind of toothbrush not only ensures good oral hygiene but helps us start the day on a good note. 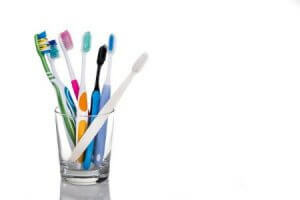 In this article, we will explain how you can choose the right kind of toothbrush for your particular needs, and provide you with a ranking of the top 10 best toothbrushes you can buy online. It is important to think about a few things when trying to choose the right toothbrush. There is no one perfect toothbrush for everyone; if you choose a brush that is unsuitable for your teeth and gums, you will be compromising on your oral hygiene, so you must be careful while choosing. Most importantly, the brush should reach all of your teeth and clean them properly, including the ones at the back. It should also clean the gaps between teeth, where bits of food can get stuck. When selecting a toothbrush, you must look into its specifications to make sure all of its features are in line with your needs and the product is within your budget. 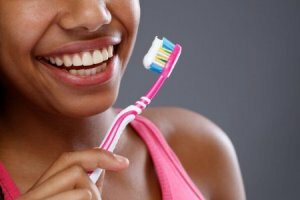 The following five aspects are the most important ones for choosing the right kind of toothbrush, so keep them in mind when you’re looking at different products. Toothbrushes with firm bristles are usually not recommended, as they can cause exceptional damage to the teeth and gums. Go for soft or medium bristle toothbrushes, unless your dentist recommends a firmer one. While they do remove a little more plaque than softer bristles, the damage hard bristles cause to the teeth outweighs this little benefit. There are different patterns in which bristles are arranged. A block type toothbrush, as the name suggests, has bristles arranged evenly like a block, which works better if you have even teeth, without too many gaps. On the other hand, a toothbrush with bristles arranged in a wavy pattern is good for reaching uneven areas around teeth. Brushes with multi-level patterns can also effectively clean gaps between teeth. Brushes with round-ended bristles are great for cleaning the gaps between the teeth to prevent decay and cavities. There are also some which are specifically designed with different types of bristles and cleaners at the sides and the back to clean even hard-to-reach areas inside the mouth. Plaque can often form in “periodontal pockets” which are the gaps around the teeth, and this can eventually lead to gum diseases, and in more severe cases, teeth becoming loose. Brushes with thin bristles effectively clean these gaps to prevent gingivitis and other periodontal diseases. Choosing a smaller head would allow one to reach every nook and cranny in the mouth. If there are uneven gaps between your teeth, choosing a toothbrush with a smaller head would be better good for you too. However, if your teeth are considerably even, then a large head would also be alright as it would allow you to brush more teeth. We shall now introduce our top 10 picks for the best toothbrushes you can buy online in India, and we hope you’re able to find to suit your needs from among these! This toothbrush is made of bamboo and is a biodegradable product. In addition to being eco-friendly, it comes with medium bristles which do not feel harsh but still clean the teeth effectively. It has a small head to make sure you can reach all the little gaps between the teeth. It is perfect for those who do not mind spending a bit in order to reduce pollution and save the planet. However, since this toothbrush is made of natural materials, it is not as durable as those made of plastic. Furthermore, the neck of this toothbrush is not too flexible, so it can be hard to use. It is also quite an expensive product, so if you are looking for an affordable option, you should consider one of the other products on the list. The bristles of this brush are 17 times finer than ordinary round ended ones, enabling it to clean even the smallest gaps gently yet efficiently. Its flexible neck also aids in reaching all sides of the teeth easily. These two aspects make it a good choice for those who have uneven teeth with gaps, or for those with delicate gums. On the downside though, this product lacks a tongue cleaner, which is necessary for maintaining oral hygiene. Having a tongue cleaner at the back of the brush is quite handy, especially when travelling, which is why this is not the best choice for those who travel frequently or simply those who want a brush with a tongue cleaner. Although this is a manual toothbrush, it can give a tough competition to any electric toothbrush. It has a unique design featuring a flexible head, which works extremely well for hard-to-reach areas and uneven teeth. The head is also fairly large with medium firm bristles, which makes it great for those who want to brush their teeth faster, without compromising on the thoroughness. However, it can be rough on the gums and is therefore not recommended for those with sensitive gums. 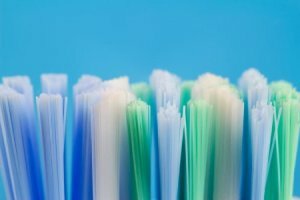 Furthermore, the bristles are not packed densely enough, which results in toothpaste, food particles, or plaque getting stuck at the bottom, making it hard to keep the brush clean. The price of this product is also much higher compared to the rest, so if you’re on a budget, you might want to consider one of the other choices. If you have sensitive teeth and are looking for a gentle toothbrush, this product is for you! Its soft bristles treat your teeth and gums with care, and its easy-to-hold handle makes the experience of brushing your teeth more comfortable. Furthermore, this is also a really affordable option since you get 3 toothbrushes for ₹89. The toothbrush does lack a tongue cleaner though, which is an important feature in a toothbrush. In addition, the head may seem too small to some users, so if you’re not a fan of smaller heads, you might want to look at other products. 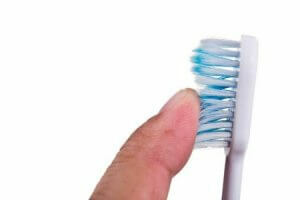 The bristles can also be an issue as softer ones usually wear out much faster compared to others. Many of us don’t have the time to floss regularly, but with this toothbrush, you may not have to worry about that as much. It has an innovative design which helps the bristles remove any food particles and plaque stuck in the gaps between the teeth. It is also quite moderately priced, so if you’re looking for an affordable option to clean uneven teeth and hard-to-reach areas, you should consider getting this one! On the downside, if you are someone with sensitive gums and teeth, this is not the right choice for you as the bristles are definitely on the harder side. It is also not great for those who do not like bigger brush heads, or those who want a toothbrush with dense bristles as the ones on this one may seem quite sparse to clean the surface of even teeth properly. If you live in a humid area, the chances of microbes growing on your wet toothbrush are quite high, which is why this product is perfect for you! 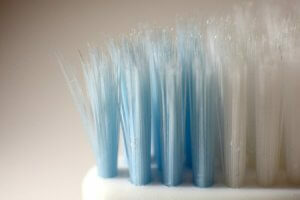 Its bristles are protected against microbes, which makes this toothbrush much safer to use than the others. Additionally, the rubber bristles on the sides are great for cleaning the gums, while the thickness of the handle makes it easier to grip the toothbrush. However, the bristles do not hold up against pressure really well and wear out quite easily. Therefore, if you’re someone who brushes really hard, this isn’t the right product for you, unless you don’t mind changing your toothbrush every two weeks or so. Another downside to this toothbrush is its lack of a tongue cleaner, which is essential for those with bad breath, or those who travel frequently and don’t want to carry two separate products. It can be quite difficult to find a good toothbrush which works with braces or retainers, but the search is finally over. The top-head of this product cleans around the braces while the bottom-head properly works well below the braces and along the gums. Therefore, this is the perfect toothbrush for those with braces or uneven teeth, especially since the price isn’t too bad for a pack of three. Although, since this toothbrush has two heads, it may seem hard to hold, or store in a sanitary way. This product may also be unsuitable for those with particularly sensitive teeth and gums as the bristles are not the softest ones on the market. In addition, it does not have a tongue cleaner either, so if you really value that feature, then it would be better for you to choose one of the other options on the list. There are not that many toothbrushes which can tackle stains and odour due to caffeine intake or use of tobacco. If you’re struggling to get rid of such stains and smells, this is the perfect product for you! It has medium-firm bristles with cleansing agents which help remove stubborn stains from caffeine and nicotine, and a tongue cleaner at the back to deal with any substances causing bad breath. Furthermore, the thick handle provides a more comfortable grip to brush the teeth for an appropriate amount of time. Although this toothbrush comes at a fairly high price, it is one of the best of the best products on the market, and one of the only ones made specifically for smokers and caffeine consumers. If you’re looking for a high-quality, all-rounder toothbrush, then this is the one for you! The brush head and neck are designed to balance out any extra pressure applied by the user to prevent any damage to enamel and gums. The handle has a rubberised spot which is perfectly positioned to make it easier to grip the toothbrush while using it and prevent it from hurting the gums. Furthermore, it is a great product to take with you when travelling as it is extremely lightweight, considerably durable, and has a tongue cleaner too. Just like the brush, the tongue cleaner is also really effective and gets rid of any malodorous substances on the tongue. It is also not too expensive, which makes it great for those who are looking for a budget-friendly option as well. The best toothbrush on the market, this toothbrush is one of the most uniquely designed options you can find. Its bristles are extremely thin, soft, and dense, to reach the gaps between the teeth and along the gums. This enables them to get rid of any food particles or plaque and keep the germs at bay. The charcoal used in the bristles is also an important feature as it takes care of any plaque, germs, and persistent bad breath issues. Even people with sensitive teeth and gums can use this product without any worries as its soft bristles do not cause any damage to the gums or the enamel. This toothbrush also works for those with uneven teeth as its fine bristles are really effective at cleaning all the gaps around the teeth. 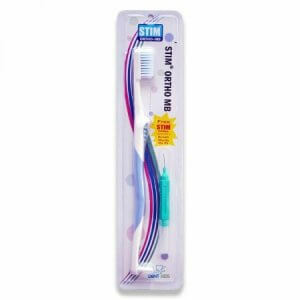 Furthermore, even those who do not want to spend too much but still want a good-quality toothbrush can get this as it is quite affordable. It may seem like a hassle to spend time selecting the right toothbrush, but it is essential that you spend time choosing one based on your needs. Just like any other product, if you buy a toothbrush after proper research, you will see a clear difference in the results. 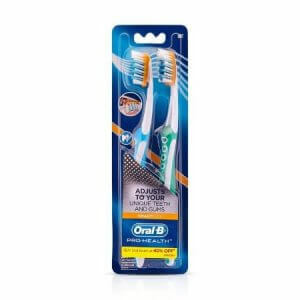 Hopefully, our article was able to make the process of choosing a toothbrush a bit easier for you, and you were able to find a suitable option with the help of our recommendations and suggestions.